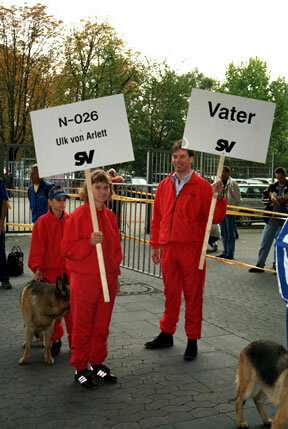 I called the Arlett Kennel in Germany in September 1998, and spoke to Thijs van Dorssen. 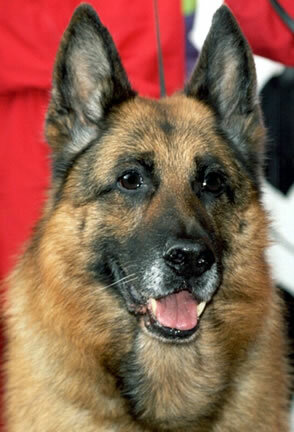 I told him that we were interested in purchasing a son of Ulk, and reminded him of our visit to the Kennel back in 1997. He was very friendly and helpful. But it was not easy to get a son of Ulk. In August 1998, Ulk�s son Rikkor von Bad-Boll had become the World Sieger, reinforcing even further the view of Ulk as a great producer. It seemed as if suddenly every one wanted a son of Ulk. Our visit in 1997 may have helped, as Thijs informed me that one of their females, Blixie von Aducht, had been bred to Ulk, and that we could have a male from that litter when it was born. Blixie was the daughter of Flick von Arlett, who had impressed us so much. We immediately bought a puppy from the as yet unborn litter! On October 17, 1998, I received an e-mail from Thijs confirming the birth of the litter on October 16. Jutta and I figured that the puppy would be nearly ten weeks old by December 24. In early December, Jutta and Margit talked on the telephone. Margit said that the litter was a �super� litter, and that there were two males. One looked like Flick, the other one like Ulk. She had selected the one that looked like Ulk for us. The puppies would be about 8 weeks old on December 11. We, therefore, decided to fly to Germany on December 11, arriving on December 12. The next order of business was to select a name for the puppy. Margit told us that this would be a �D� litter, and sent us the names of all her previous �D� litters, as the names could not be used more than once. Jutta and I looked up a lot of names starting with �D�. We wanted to use Dino, but it had already been used. I wanted Ducio, but Jutta did not like it. Jutta selected Duke, but I did not like it. And so it went. Finally, Jutta came up with the name Dasko, which she devised. I accepted. It seemed original, but we were later to find out that there were other Daskos out there.